In only a 3' x 4' area, you can perform an unlimited amount of exercises that will sculpt your body into statuesque form, safely and quickly. Dual 160 Lb. weight stacks offer a resistance range fit for beginners and professional athletes alike. 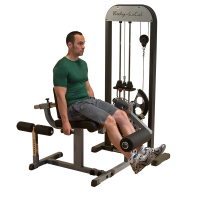 With a simple pop-pin adjustment, the vertically adjustable pulleys can be set for over 100 exercises at a level that is comfortable for any size user. When it comes to stability and durability, Body-Solid can't be beat with heavy gauge 2" x 4" mainframe construction and aircraft quality cables and pulleys. When you’re ready to build muscular legs and stronger knee joints, the Leg Extension Machine is ready to help you meet your goals. The exceptionally strong mainframe combined with a specially contoured DuraFirm™ thigh pad and biomechanically exact movement pattern provide a smooth, solid feel and immediate response. Precise pivot point alignment and center-drive, variable resistance cam design deliver the smooth and powerful response you expect. Recumbent DuraFirm™ back pad adjusts for all-size users and eliminates lower back strain while allowing full range-of-motion. 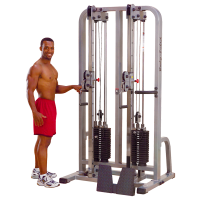 This remarkable double capacity machine permits you to practice two noteworthy muscle bunches (abs and back) at one incredible ease. This imaginative business configuration has a full range cam outline with a simple to utilize pop stick that permits an extra 20 acclimations to build control and scope of movement. STACK UP YOUR PERSONAL BEST WITH BODY-SOLID'S STAND ALONG FUSION CHIN DIP With its weight-assisted kneepad mechanism, the Fusion Chin-Dip provides the same benefits of chin and dip exercises to everyone, regardless of their current fitness level or weight. Plus, its 210 lb. weight stack enables you to counterbalance your own bodyweight. The ProSelect Multi press is the most versatile selectorized piece in the Body-Solid line. 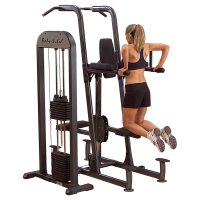 With built in functional training arms, the GMFP-STK allows for vertical chest presses, incline and decline presses from a multi-adjustable seated position.